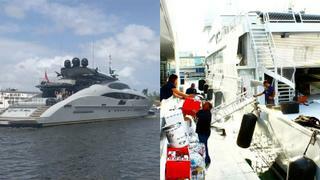 Pictures courtesy of Instagram.com / @lauderdalemarinecenter (left) / @oneoceanportvell (right). In the ongoing events of the extreme hurricane season, Boat International strives to provide updates for the superyacht community in the Caribbean and Americas. To get involved with the Hurricane Irma relief effort, follow this link. Burgess has teamed up with owners and captains in order to send some of its fleet to the Caribbean with relief supplies. 54.7 metre Sequel P and 61.5 metre Katherine are currently en-route, while 46.51 metre Va Bene has already dropped off supplies from Mallorca in Dominica (pictured above left) and restocked in Antigua. Part of established charity Yacht Aid Global and co-founded by MYBA, the charitable organisation Superyacht Aid Coalition looks to make use of the superyacht industry's resources in order to supply disaster relief to the Caribbean. Currently, there is a call for contributions of carpentry tools, construction materials, equipment and machinery of all kinds in order to be loaded onto 60 metre Slipstream, which will head to the Caribbean later this year. Trucks will be stopping in Port Vauban, Antibes on the 27th of November in order to collect donations and, for those that are in the Antibes area, Ecomer will also be collecting directly from the yachts. The trucks will leave on the same day and head to Marseille to join Slipstream which is currently in dry dock. 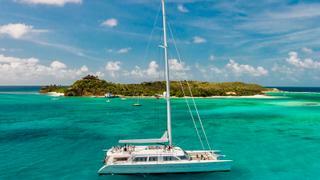 It has been announced that as of November 1, the British Virgin Islands will be welcoming yachts with a number of charter companies planning to resume sailing for the winter season. Additionally, the highly-anticipated Anegada Lobster Festival will be held on 25-26 November and the BVI Charter Yacht Society Boat Show will be held at Nanny Cay Marina from 7-10 November. "The BVIs have historically been the sailing capital of the world," Charter Yacht Society chairman Ruth Ross said. "And the reasons for this have not changed. Our water is still brilliant blue, the anchorages are still beautiful and near one another, and the trade winds will be blowing." Commercial flights to the BVIs have resumed, and visitors can reach the territory via connections in San Juan, St. Thomas, Antigua and St. Maarten. Upon arrival, visitors will have access to car rentals and taxis ready for hire, albeit with fewer vehicles available in some cases. Scheduled to take place from November 11-14, it has been announced that the U.S.V.I. Charter Yacht Show in St Thomas at the IGY Marinas Yacht Haven Grande marina. It will be hosted by the Virgin Islands Professional Charter Association (VIPCA). 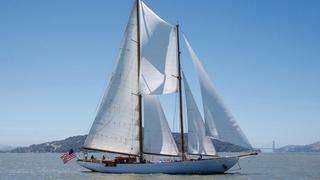 More than 50 vessels will be on display, including 28 metre Suite Life and 35 metre Eros (pictured above). At the event, a marine charter conference will be held with emphasis on “voluntourism” and how charter guests can participate in hurricane relief work while on vacation. It has been announced that the marina Casa de Campo resort in La Romana, Dominican Republic, is working at full capacity having avoided damage from hurricanes Irma and Maria. "After the passing of hurricanes Maria and Irma through the Caribbean, we inform that Marina Casa de Campo is completely intact, none of our facilities have suffered any damage," said Vilma Nuñez, marketing manager at the marina. "We are ready to receive yachts in the 2017/2018 season." The marina can host yachts up to 76.2 metres and offers direct refuelling, dry dock facilities, a shipyard for repairs and a beautiful yacht club. The RORC Transatlantic Race, the longest race in the Royal Ocean Racing Club’s offshore calendar, will now finish at the Camper & Nicholsons marina Port Loius. The celebration will run in partnership with the YCCS, as the race was originally scheduled to finish at its British Virgin Islands base. “It is a great pleasure to once again be welcoming the RORC race boats in Port Louis Marina, Grenada for the fourth successive year. We have been pleased to work closely with the race organisers to ensure the race finish is a success for everyone. Our marina team will welcome each of the yachts individually as they arrive after their mammoth journey across the Atlantic and we wish everyone the best of luck,” said Glynn Thomas, general manager at Port Louis Marina. "It is extremely sad news that the recent natural disasters have decimated the Virgin Islands making it unviable to take the race to YCCS on Virgin Gorda, BVIs," explains RORC CEO, Eddie Warden Owen. "The RORC Committee in consultation with the YCCS and NRV have therefore decided to finish the race in Grenada and we look forward to returning to Camper & Nicholsons' Port Louis Marina who have warmly welcomed competitors and our race team for the past three events." After a meeting in Washington with the Global Facility for Disaster Reduction and Recover and the UN Office for Disaster Risk Reduction to discuss hurricane recovery and a meeting with the Prime minister of Grenada, Richard Branson has come up with the "Marshall Plan" to create a greener and more resilient future for the islands. It has been agreed that the pan with be jointly funded by the World Bank and the Inter-American Development Bank. 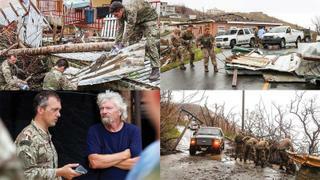 Branson said: "I’ve spent much of my time in the last few weeks dealing with the devastating impacts the hurricanes had on the beautiful Caribbean, and trying to find ways in which we can rebuild all that’s been lost and help the affected communities back on their feet. "As our Caribbean corner of the world is subjected to nature's fury, I can’t help but ask how much more destruction is needed to show that the way we treat our planet is having serious consequences. Scientists have highlighted the link between carbon emissions and ocean surface temperatures. When Irma struck, Atlantic and Caribbean waters had reached temperatures of 86 degrees Fahrenheit in some places. I don’t need any further proof than that to know the time to act is now — globally and locally. "To find leadership in this space, you don’t have to look much further than what is already being done in the Caribbean. A few years back, Aruba announced an ambitious strategy to run entirely on renewables by 2020, and the island is already halfway there. And in Barbados, one in two households are now using solar water heaters, not only reducing electricity cost, but also creating jobs in a budding solar industry. These are fantastic examples. What we need now is scale." Saba: Although directly impacted by the hurricanes, Saba has made a speedy recovery and all essential services are up and running. Turks and Caicos: The Turks and Caicos were significantly impacted by Irma and Maria. Blue Haven Marina is partially open and operational with diesel, gas and yacht concierge. No slips over 12 metres are available. We aim to be open for either February 2018 or May/June 2018. St. Maarten: St. Maarten was significantly affected by the passage of Hurricane Irma. The clean-up and rebuilding effort has been amazing in its speed and efficiency considering the many challenges. Marine services, bars, restaurants have been opening daily, although many buildings suffered serious damage and will not be operational this season. 25% of the Isle de Sol Marina is expected to be operational by November. Port de Plaisance Marina is partially open/operational. Simpson Bay Marina will be open by November, with more slips in December. The Palapa Marina expects to open for this season. St. Barths: St Barths was hit hard by Irma. However, recovery is swift, and the island has committed to its famous New Years Party. They have also confirmed that both the St Barths Bucket and Les Voiles de St Barths will proceed as planned in 2018. Shops and restaurants are cleaning up and opening, and some hotels and villas will be ready for the season. BWA Yachting St Barths, Super Yacht St Barths and St Barths Tours & Travel are all fully open. It has been announced that Eden Rock – St Barths plans an extensive programme of restoration and further improvement prior to reopening in Summer 2018, while Eden Rock Villa Rental is to resume trading in November 2017. The rapper shared a video on Instagram announcing that he will be donating $100,000 to help to victims recovering from Hurricane Maria in Puerto Rico. The above picture, posted on Facebook on October 1, shows the Zr. 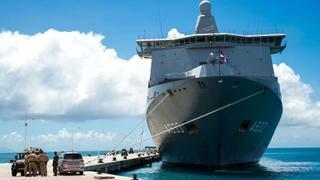 MS Karel Doorman of the Royal Netherlands Navy arriving in St Maarten with much needed storm relief supplies including telecommunication support, police vehicles, building materials, educational supplies, food and water. As hurricane relief efforts from Irma and Maria continue in the Caribbean, Offshore Passages Opportunities (OPO), the largest crew networking service in North America, is using the power of its membership to make a difference in St. Maarten and Dominica. Through its Friends of St. Maarten Relief Fund and Caribbean Mooring Field Development Foundation, the organisation has raised almost $30,000 in funds that will be used 100% toward recovery on the two islands. As well, OPO has organised the Irma Relief Crew for St. Maarten Recovery program to provide “boots on the ground” assistance. “We are not just asking OPO members to dig deep and help; we also are reaching out to all others with means beyond those of the people in the Caribbean who are living on small independent islands with few resources to help them recover,” said Schmitt, who says he’ll be paying the 2.48% credit card transaction fees on all donations so that 100% of the money collected by OPO will be put in the hands of someone in need in St. Maarten or Dominica. Schmitt says that OPO volunteers, who already have begun sailing relief supplies to the Caribbean on their own boats or as crew for someone else, also can volunteer on the ground this winter to help with rebuilding efforts. “Once we get set up in St. Maarten, we plan to offer bunks for volunteer crew to come work during the day and spend a few dollars on burgers and beer on the beach at night,” said Schmitt. 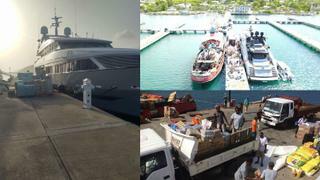 SuperYacht Aid Coalition (SAC)—comprised of a fleet of superyachts, businesses, and yacht support services to provide much needed relief and supplies to hurricane ravaged islands in the Caribbean—has deployed YachtAid Global (YAG) to use its proven logistical skill to fulfill the superyacht industry’s response to Hurricanes Irma and Maria. “During the Monaco Yacht Show, a work group consisting of many important industry groups gathered together to organize a comprehensive response to the unfathomable Caribbean disaster which has so severely impacted many islands which have hosted and fostered our industry and businesses for many decades,” says Norma Trease, founding member of SAC. “New interest and financial support increases each day.” she adds. In addition to organising and deploying resources to the Caribbean, YAG is also involved in communication, public relations, and fundraising for SuperYacht Aid Coalition. It has been announced that as of October 29 the Dutch airline KLM will be resuming flights to St Maarten, after the island's Princess Juliana airport suffered damage due to Hurricane Irma. There will be a reduced service of two weekly flights instead of the usual four and flights will make a stopover in Curacao. The airline also announced that there would be an increase in flights to Curacao, with three extra per week added to the current seven scheduled flights to the island each week. 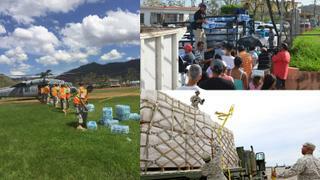 It was announced on October 2 that relief had begun to arrive in the storm-ravaged rural areas of Puerto Rico. At a news conference Richardo Rosselló, Puerto Rico's governor, said that approximately 10 per cent of homes are expected to have electricity within the next two weeks, and 25 per cent within the month. After a surge of aid to the country, including fuel, federal government personnel and food supplies arrived on the morning of October 1, Rosselló confirmed that 47 per cent of residents have running water and that that number should rise to 60 per cent by the end of the week. On October 1 Rosselló told reporters that more than half a million barrels of diesel fuel and nearly a million barrels of gasoline would reach the country in order to power emergency generators, especially in hospitals, and to distribute supplies. Ten hospitals now have electricity and it is hoped that two others could regain power by Monday. "A lot of us who traditionally went to the Caribbean are looking at the absolute tragedy of everything that has happened there this year. I've made a decision that, whatever happens, I want to go there. I want to have my boat repaired – I'm having different things done to the boat not here in Europe but there to make sure that the revenue and the stream of funding goes back to the people. "They've had the most horrific time... Those of you who have boats who are thinking twice about going back to the Caribbean I would urge you please, think seriously about it. They need your dollars, they need your pounds, they need your euros. But more than anything, they need you to show solidarity and support for humanity and please, think about going there because it's so special. It is a magic place that we've all enjoyed so many years pleasure there and this is the time that they need our support." It has been announced the St Thomas International Regatta (March 23-25), the Round the Rocks Regatta (March 22), the Les Voiles de St. Barth (April 8-14) and the Antigua Classic Yacht Regatta (April 18-24) will all continue as planned despite the damage caused by the hurricanes. “We are working hard so that the island can welcome all of our guests, crews and spectators with the same level of hospitality and professionalism as usual,” announced François Tolède, who organises Les Voiles along with Luc Poupon and a large group of volunteers. Commodore of the Antigua Yacht Club and President of the Antigua and Barbuda Marine Association Franklyn Braithwaite said: "Many people have been in touch to check that Antigua is still up and running. We thank them immensely for their concern for our island; we have been lucky. Many people have asked how they can help the affected islands. On October 2 the 45.72 metre Palmer Johnson superyacht Grey Matters departed from Lauderdale Marine Centre loaded with relief supplies on route for the Caribbean. On October 3 the 63.4 metre Halter yacht SuRi departed from One Ocean Port Vell in Barcelona to deliver relief supplies to a variety of organisation in the Caribbean. On September 27 the Cheoy Lee 45 metre yacht Dorothea III arrived in the Turks and Caicos to deliver clean drinking water and other supplies. Richard Branson, the owner of Virgin Limited Edition was in the BVIs at the time and has already dedicated his resources to the cause. Necker Island Resort was of course not spared in this disastrous event. Fortunately, Necker Belle, a 32 metre luxury sailing yacht, was able to leave with her captain to Barbados, where she escaped any major damages. The yacht is now returning to the BVIs full of humanitarian supplies provided by her owner to help the locals of the Virgin Islands. Necker Belle is working with Yacht Aid Global to provide this humanitarian support. 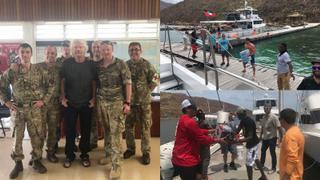 Branson is also working hand in hand with the British government to rebuild the BVIs. Virgin Unite, Unite BVI and Virgin Limited Edition are working together with the local communities and organizations to repair the damages the hurricane caused, attend to the most primitive needs of the communities and assist the most affected ones in their recovery. Dream Yacht Charter founder, Loic Bonnet, said: “Our fleet and business remains strong after the impact of Hurricanes Irma and Maria across the Caribbean, which hit St. Martin, the British Virgin Islands (BVI) and Puerto Rico particularly hard. “Our Caribbean fleet capacity will be restored by the end of this year. Dream Yacht Charter had 70 boats in St. Martin and the BVI when Irma hit and we anticipate 60% will be declared a total loss, although we’ve yet to have a final report from the loss adjustors. While the impact on our fleet and 2017 revenue is significant, it is more than manageable and we’ve rolled out our business continuity plans. Our bases in Antigua, Martinique, St. Vincent and Grenada are fully operational. Our fleet in Guadeloupe escaped damage from Hurricane Maria, as our Caribbean operations manager relocated boats to bases further south. Our Puerto Rico fleet didn’t sustain major damage and our base will be fully operational mid-October. 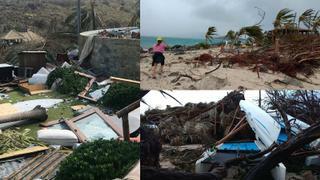 Our thoughts remain with the people of all the islands so devastated by these two storms. With the support of the International Yachting Community and guidance from our partners on the ground in the Caribbean, Sea Mercy was honored to be asked to lead the Disaster Response & Recovery efforts in the Caribbean on their behalf. Paul Deeth (Chairman Antigua Charter Yacht Meeting) and Mrs. Anne-Marie Martin (Parks Commissioner of the National Park in Antigua and Board Member of ACYM) will help establish and oversee Sea Mercy's Caribbean Headquarters in English Harbor, Antigua and help to further engage the initial and ongoing support of the International Yachting Community. Sea Mercy and our experienced international leadership team that includes Superyacht Captains, Disaster Response Directors, and industry partners, will direct the ongoing day to day operations of our transport vessels and volunteers (expected to last from 12-24 months). Airbnb are appealing to people with properties in Florida Panhandle, Tallahassee, greater Orlando, greater Miami, greater Tampa, Northern Georgia, North Carolina, South Carolina and Alabama to make their homes available for evacuees and relief workers deployed to help until October 13. The Governor of Puerto Rico spoke to CNN late on September 20 regarding the enormous damage to the state-owned power grid. The island is currently without power and it may takes months to be fully restored. On September 20, he set a 6pm–6am curfew, which will be in place until September 23. "[Power restoration] depends on the damage to the infrastructure. I'm afraid it's probably going to be severe. If it is we're looking at months as opposed to weeks or days." Late on September 20, he noted that there was still no communication with the southeastern part of the island, which had been hit first and most ferociously by the storm. Maria continues to lash the northeastern Dominican Republic. Expected to pass near the Turks and Caicos later today. Hurricane Maria is a major hurricane once again, centered as of 5 a.m. AST about 70 miles (110 km) north of Punta Cuna, Dominican Republic and about 220 miles (350 km) southeast of Grand Turk Island. Maria is moving toward the northwest near 9 mph (15 km/h), and this general motion is expected through tonight. A turn toward the north-northwest is forecast on Friday. On the forecast track, the eye of Hurricane Maria will continue to pass offshore of the northeastern coast of the Dominican Republic today, move near the Turks and Caicos Islands and the southeastern Bahamas tonight and Friday. Islands and the southeastern Bahamas tonight, with tropical storm conditions beginning in these areas later today. Strong gusty winds are still occurring over portions of Puerto Rico, but should continue to gradually subside this morning. Maximum sustained winds are near 115 mph (185 km/h) with higher gusts - a category 3 hurricane on the Saffir-Simpson Hurricane Wind Scale. Some strengthening is possible during the next day or so. Hurricane-force winds extend outward up to 60 miles (95 km) from the center and tropical-storm-force winds extend outward up to 150 miles (240 km). Punta Cana in the eastern Dominican Republic recently reported a wind gust to 56 mph (91 km/h). 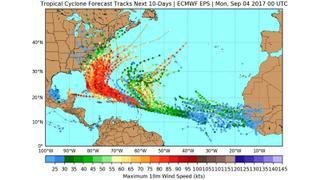 The estimated minimum central pressure is 959 mb (28.32 inches). The above images were shared on Instagram on September 21 depicting soldiers at work on the island of Tortola with the below caption. "Royal Marines alongside partners from DFID, the FCO, regional governance and aid agencies will endure alongside local communities across the British Oversees Territories during Storm Maria. "On the Islands, the focus for Royal Marines and Army Commandos has shifted from rebuilding for the long term to preparations for the short term impacts of Maria. The UK has been tracking the development of the tropical storm for days and it is possible that Maria will increase in magnitude to hurricane strength, amassing damage already caused by Hurricane Irma. "With the tail end of Hurricane Maria still being felt, Royal Marines from 40 Commando were straight out across the island to ensure critical routes were clear and they understood what the islanders needed. "With heavy rain and driving winds through the night it was crucial that both remote and main routes were clear of debris and unblocked if flooded. It was also vital to understand the effect this weather had had on the local people and what they were in greatest need of, allowing intelligent aid distribution. Therefore Assault Engineers were deployed as the muscle, and members of the unit’s intelligence section as the brains to transit the length of Tortola. "The assault engineers, who have been relentless in their work on this operation, began clearing the roads of the remnants of houses and unblocking drains of earth and branches. Many slopes had suffered landslides overnight and made routes impassable." September 20: Come see us at the Norwalk Boat Show this weekend... we are raising funds for the wonderful people of the Virgin Gorda community, devastated by Hurricane Irma. Every dime raised goes toward helping the community get back on its feet. For donations made at the show, we will have hats from HIHO and shirts from RailRiders Adventure Clothing. Booth 444 at the show. And we will be doing the same at the Annapolis Boat Shows in early October. We are incredibly grateful for the overwhelming generosity of our Bitter End community in support of our colleagues and friends in Virgin Gorda who have lost so much in this storm. We are all heartbroken over what has transpired. Lauren and I arrived in Puerto Rico on the morning of September 8th, two days after Irma had torn through North Sound. We flew down on board a plane loaded with relief supplies for Virgin Gorda and we knew we were on the right track when one of Bitter End’s most loyal Puerto Rican families met us on the tarmac and began helping to unload the plane. It was just the beginning of the extraordinary generosity, energy and outpouring of affection for Bitter End and Virgin Gorda that we have seen over the past several days. They and their entire community are selflessly volunteering their boats, their homes, their time and all sorts of other resources to help the North Sound community as well as the rest of Virgin Gorda. 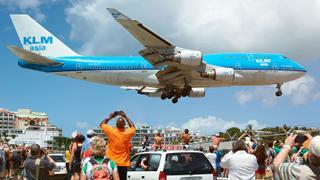 Many others such as the aviation community are demonstrating similar dedication to Virgin Gorda. We loaded up our Puerto Rican friends’ boats and immediately headed to Virgin Gorda, where we discharged supplies at a wreck-strewn Yacht Harbour before proceeding to North Sound and Bitter End. As you know, we had had no direct contact with our six colleagues that rode out Irma at Bitter End since communications went down around 10 AM on the day of the storm. Twenty-six hours elapsed before we learned via Necker that all at Bitter End were safe. It wasn’t until we arrived at Bitter End and received firsthand reports that we learned how incredibly harrowing and dangerous their experience had been. Now that we have spoken with more people from the community, our colleagues’ experience was no less frightening than many others’. More important, it was clear that after surviving an unimaginable natural disaster, Virgin Gordians were facing an equally challenging and dangerous humanitarian disaster - no water, no power, no communications, limited supplies of critical pharmaceuticals, little in the way of medical personnel and facilities, food and fuel were in short supply and a critical absence of intact shelter. On Saturday morning, we were able to deliver supplies to the North Sound community and to evacuate Stacia, Joe and Scottie while Marcus, Chico and Mar chose to remain in Virgin Gorda. We also evacuated at least thirty others from North Sound and the Valley. Lauren and I will base in Puerto Rico for a while and travel back and forth to North Sound so we can help our Puerto Rican friends and North Sound neighbors deliver relief supplies and anything else that can help the people that are in need; and there are enormous needs ranging from medical, to security to a myriad of other resources. We also will be organizing Bitter End’s cleanup and planting the seeds for its recovery. It’s all truly daunting but worth every ounce of effort that goes into it. A heartfelt thank you to our friends in the North Sound and all over the world for your support. We owe special thanks to our friends right here in Puerto Rico (also known as the Puerto Rican Navy Relief Efforts). This brigade of heroes continues to give tirelessly to the relief efforts. We ask all of you to please continue spreading awareness in your own communities. The best way to support the relief effort now is to make a donation, no matter how small, to one of the many funds set up to support those impacted by Hurricane Irma in the Caribbean. It is a long road ahead. We will need everyone’s help as we journey down the path. "Thank you very much for your concern about the passing of Hurricane Irma. We inform you that this Monday we began our work in our Yacht Club, after more than a week without electricity. "Thanks to our preparedness to face such a devastating hurricane, the headquarters of our Yacht Club did not suffer serious damage. During this past week we worked very hard to leave the headquarters of HIYC of Cuba ready to welcome its members and guests. No vessel was harmed at Marina Hemingway. "Our country suffered the consequences of this devastating hurricane that left the entire island without electricity for some days. We are very concerned about the damages our friends may have suffered in the Caribbean and Florida." "If you are not able to stay at home due to damage we are posting emergency shelters details." 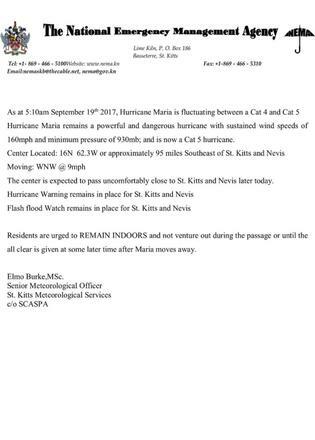 Shelter #HurricaneMaria District 8 St. Peter's Comty Cntr Patricia Nurse-Clarke / Roy Rogers: 663-4116/763-6653 / 660-8614/760-0101"
For further updates, check PM Harris' Twitter feed @pmharriskn. 6:24am – "Initial reports are of widespread devastation. So far we have lost all what money can buy and replace. My greatest fear for the morning is that we will wake to news of serious physical injury and possible deaths as a result of likely landslides triggered by persistent rains. "So, far the winds have swept away the roofs of almost every person I have spoken to or otherwise made contact with. The roof to my own official residence was among the first to go and this apparently triggered an avalanche of torn away roofs in the city and the countryside. "I am honestly not preoccupied with physical damage at this time, because it is devastating...indeed, mind boggling. 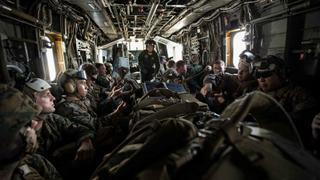 My focus now is in rescuing the trapped and securing medical assistance for the injured. We will need help, my friend, we will need help of all kinds. "It is too early to speak of the condition of the air and seaports, but I suspect both will be inoperable for a few days. That is why I am eager now to solicit the support of friendly nations and organisations with helicopter services, for I personally am eager to get up and get around the country to see and determine what's needed." 2:29am – "I have been rescued." 2:21am – "My roof is gone. I am at the complete mercy of the hurricane. House is flooding." "Maria will affect portions of the Leeward Islands and the British and U.S. Virgin Islands as an extremely dangerous major hurricane during the next couple of days, and hurricane warnings are in effect for many of these islands. "Maria is likely to affect Puerto Rico as an extremely dangerous major hurricane, and a hurricane warning has been issued for that island. "The potential for a life-threatening storm surge, accompanied by large and destructive waves, has increased for the Leeward Islands, the Virgin Islands and Puerto Rico. "Life-threatening flash floods and mudslides from heavy rainfall are expected across the Leeward Islands, including Puerto Rico and the U.S. and British Virgin Islands." It was announced early September 18 that the Tropical Storm Maria is expected to develop into a major hurricane in the next two days and is nearing the Leeward Islands. 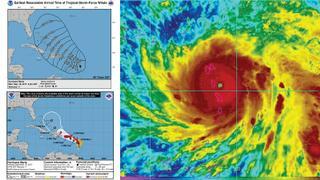 Tracing a similar path to Irma, warnings have been issued in St Kitts and Nevis, Montserrat, Martinique, Guadeloupe and Dominica. The Puerto Rican government has released a statement saying it expects Maria to hit as a category three hurricane on September 19. Hurricane Jose is still currently active in the Atlantic. A Hurricane Watch has been issued for Puerto Rico, Vieques, and Culebra. Guadeloupe, Dominica, St. Kitts, Nevis, and Montserrat, Martinique. 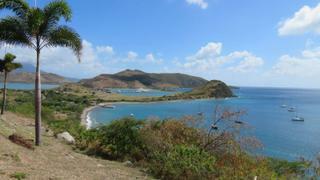 Antigua and Barbuda, Saba and St. Eustatius, St. Lucia. Puerto Rico, Vieques, and Culebra, U.S. Virgin Islands, British Virgin Islands, Saba and St. Eustatius, St. Maarten, St. Barthelemy, Anguilla. Barbados, St. Vincent and the Grenadines. At 500 AM AST (0900 UTC), the center of Hurricane Maria was located near latitude 14.6 North, longitude 59.5 West. Maria is moving toward the west-northwest near 13 mph (20 km/h), and this motion with a decrease in forward speed is expected through Tuesday night. On the forecast track, the center of Maria will move across the Leeward Islands late today and tonight and then over the extreme northeastern Caribbean Sea Tuesday and Tuesday night. Maximum sustained winds are near 90 mph (150 km/h) with higher gusts. Significant strengthening is forecast during the next 48 hours, and Maria is expected to become a dangerous major hurricane before it moves through the Leeward Islands. “We have seen over the weekend that the overall losses wreaked by Hurricane Irma UK could be considerably lower than first predicted. For the UK market, the losses may be lower than other territories due to the fact that most UK yacht owners who travel to the Caribbean tend to avoid hurricane season. UK yacht owners tend to base themselves, until the end of October, in the Mediterranean if not in UK waters. Christophe Harbour, the 2,500-acre resort and superyacht marina destination on the southeastern peninsula of St. Kitts, reported that the community and the larger island nation of St. Kitts and Nevis were spared significant damage from Hurricane Irma. The Marina at Christophe Harbour is open and operational and providing fuel and berthing for vessels displaced by the storm, and the new Park Hyatt St. Kitts Christophe Harbour is still scheduled to open 1 November 2017. Considering the minimal damage that was sustained, the island’s tourism providers – including hotels, restaurants, attractions, shops – have all reopened, and the Robert L. Bradshaw International Airport is operating fully. In addition, the Caribbean Sailing Association announced that the region’s planned regattas and sailing events are expected to proceed this season without interruption. In the past week, Christophe Harbour has received an outpouring of generous offers of support for our neighbouring islands. The destination is coordinating relief efforts with the government of St Kitts & Nevis and other stakeholders including the Department of Maritime Affairs and St. Kitts & Nevis Chamber of Industry and Commerce. All efforts are fully supported by the Ministry of Tourism. In addition, Christophe Harbour has partnered with YachtAid Global, the disaster relief aid and humanitarian support service focused on remote coastal communities, and is the organization’s regional base of operations for assisting in the relief effort. As tourism and yachting are mainstays of the larger Caribbean economy, Christophe Harbour joins its neighbouring islands in encouraging continued travel to the region this season. Doing so will not only minimize the storm’s larger economic impact, but also ensure those who were affected recover quickly. Christophe Harbour is incredibly grateful for the generous offers of support it has received from around the world and remains fully committed to assisting our neighbouring islands. YachtAid Global is currently receiving inquiries from yachts in Euros, the West Coast & New England asking to help. Depending on their respective ETA's, we will asses specific island needs at that time. This is why we are currently accepting monetary donations at this time. Anyone looking to assist, please visit our website or Facebook page. "We cannot thank everyone enough for all the support and concern received over the last few weeks. We consider ourselves so lucky to have been spared Irma’s wrath here in Antigua. Our hearts go out to all the islands that have been damaged by the storm, especially our sister island Barbuda. We will do everything we can to help re-build and support all the communities that have been devastated by this event. "Sheer Rocks is open as usual. We wish to remind people that the Caribbean is still the beautiful paradise it has always been and will always be. The show must go on! Antigua is open for business, so book your flights and we hope to see you very soon." Our teams are working alongside local and international emergency services and relief organizations, and have already commenced a cleanup and repair effort. Staff members and contractors are in the Caribbean to assist each facility’s team on critical repairs that can be made in order to make our facilities operational. At this time, we are optimistic that our marinas will be operational in most, if not all, affected locations for the upcoming winter season, and we will provide frequent updates on both our specific operational capabilities and the state of the surrounding infrastructure upon which our facilities, to some degree, rely. Hurricane Irma has not only affected IGY’s marinas, but also the Caribbean’s nautical tourism industry. Small business is critical to the overall health of the international maritime sector and IGY intends to lead the way in the recovery of local marine trades affected during one of the strongest storms in history. IGY will be a pivotal force in helping the maritime industry throughout the Caribbean bounce back stronger than before and will shortly be announcing specific efforts in this regard. We at IGY Rodney Bay Marina, along with the crew members of S/Y Shadow and the Carriacou Sloop Tradition thank all the individuals and organizations who provided supplies for the people of Anguilla and Sint Maarten. Your kindness is greatly appreciated. Woke up early with another full day ahead of us, organising support and distributing supplies to help the communities in the British Virgin Islands. Now some aid is getting in, my thoughts are turning to the infrastructure support we need to get the BVI back on its feet. Yesterday we talked about the positive news of the Royal Marines arriving in the BVI to give stability; having spent time with them, my admiration only grows. Now that the Marines and the police, along with the wonderful people of the BVI, have brought calm, we need to move on to the next stage. Hurricane Irma has caused the entire infrastructure to collapse. Our team are doing their best to help everybody on Virgin Gorda, but this is not sustainable, and Tortola is an even larger island. From what I can ascertain, these islands now really need the level of support only a large organisation with significant disaster management experience can provide to come in and help. Sanitation needs to be an urgent priority to stop potential outbreaks of cholera, dengue, Zika and chikungunya. After the 2010 Haiti earthquake, sewage running in the streets contributed to cholera outbreaks – without help, similar things could happen here, too. More medical assistance is needed. Our nurse, who visited the BVI’s only hospital in Tortola, tells me that they need more help since a lot of their staff have evacuated the island. She is running on 50 per cent capacity. The main supermarket supply chain needs to be reopened. Banks must organise for people to receive their paycheques in cash so that they can buy food. The UK government needs to get engineers to Tortola to get the power and water back up and running again with basic services. In the meantime, we need more containerised desalination plants and small solar-powered generators. Once the immediate threats and risks have been addressed and the BVI is able to return to some kind of normality, then what remains of the private sector needs to sit down with the BVI government and the UK government to draw up what I’ve called a Marshall Plan to rebuild this once beautiful country. Given the resilience and resourcefulness of the people I'm sure it will be possible. But it looks like the BVI needs to be rebuilt from the ground up. This will require serious government investments and guarantees. 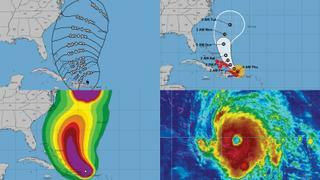 Bradford Marine Fort Lauderdale and Bradford Grand Bahama shipyards' dedicated staff prepared diligently for Hurricane Irma. We are fortunate to report that we did not experience any serious damage to property or vessels. Both facilities are up and running and we are fully staffed. We realize that many of our customers have been affected by the Hurricane and we want everyone to know that Bradford is able and ready to serve our customers. If you need assistance with your vessel, please don't hesitate to call us at 954.791.3800 or email service@bradford-marine.com. As always, Bradford Marine is standing by to serve and support the marine community. 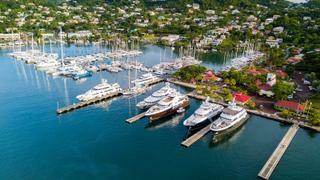 Antigua's vibrant yachting industry remains thriving and open for business. That's the word from bosses at the Antigua Charter Yacht Meeting in the aftermath of Hurricane Irma which passed through Antigua & Barbuda on September 6th, 2017. While Barbuda bore the brunt of the category five storm, Antigua was spared the damage wreaked across so many of our regional neighbours. Our hearts go out to all of our Caribbean brothers and sisters impacted by this disaster and we are now hard at work helping our beautiful sister island of Barbuda recover and return to its former glory as soon as possible. Directors and staff at the Antigua Charter Yacht Meeting have convened several times over the last few days to put firm plans in place to help ensure Irma's path of destruction does not extend to the region's economic mainstays of tourism and yachting. Your contribution is also invaluable. The Caribbean is well used to hurricanes and has time-tested plans and strategies already in place to help us bounce back quickly in the event of a disaster such as Irma. Our infrastructure is strong, our landscapes adaptable and our people strong and resilient. We ask nothing of you except that you continue to come here and enjoy what nature blessed us with - namely, our unrivalled sailing conditions and spectacular scenery - along with the hard work and dedication that earned us our prime position on the industry map. That way, you can help us help Barbuda and its proud, capable people get back on their feet. Meanwhile, efforts in Antigua are already in full swing to that effect. We are busy caring for and comforting almost 2,000 Barbudans. The international community has been very generous to date and donations are arriving to assist. The ACYM charity arm is identifying families in the greatest need and supplying food, plus school books and equipment for children of evacuees, many of whom escaped with just the clothes on their backs. Animal welfare societies, both local and international, have been feeding and tending to the animals and livestock left on Barbuda. While it might appear from media reports that the entire region is devastated, this is simply not the case. Just as Antigua was spared, so too were islands to our south and west. Today, as I write this, I am looking out over the sparkling water of Falmouth Harbour, at Montserrat on the horizon, and at the hummingbirds busy in a garden still full of flamboyant blooms and bougainvillea. Boats are in the harbours and at anchor off Pigeon Beach, and remained safely there throughout the storm. To conclude, let us reassure you, the Antigua Show organisation is firing on all cylinders and we look forward to welcoming you back this year with an action-packed calendar and the exceptional services that made our name. Thank you so much to everyone who has sent messages of support for Antigua and Barbuda over the last week. Here at Antigua Sailing Week we have been working with the Antigua and Barbuda Marine Association on co-ordinating our communications. Today the association has released the email below confirming that Antigua is geared up for the forthcoming yachting season as usual and so we thought we should share it with our network as it really says it all, both about Antigua and our neighbours. We hope that if you had already planned to take part in Antigua Sailing Week you still plan to do so and if possible we would really appreciate your support of the event by registering your interest early. "We truly appreciate the support of our friends and family across the world. Christophe Harbour is thankful to have been spared the worst here in St. Kitts and Nevis, and our community fared well thanks to our dedicated team and their preparation efforts. "The marina at Christophe Harbour is open and available to provide fuel for vessels in need as well as berthing services for those displaced by the storm. We have also partnered withYachtAid Global and are its regional base of operations for helping our neighbors in need. "Considering the minimal damage that was sustained, the islands’ tourism providers have reopened. Our restaurants, attractions and shops are open as well along with the RLB International airport. Hotels are returning to business as usual and guests are continuing to enjoy their stays. "In the past week, we have received an outpouring of generous support requests for our neighboring islands as well as requests for accommodations and transport services. We are coordinating relief efforts with the government and other stakeholders including the Department of Maritime Affairs and St. Kitts Nevis Chamber of Industry and Commerce. 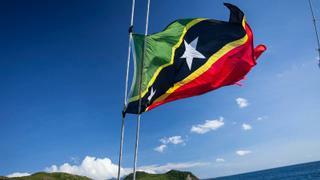 "Our hearts and prayers are with our neighboring islands who have been directly impacted." Resorts World Bimini Marina: "Due to conditions after Hurricane Irma we will not be opening Wednesday, September 13 as previously stated... FRS Caribbean ferry service to Bimini has been cancelled for this week and Elite Airways flights have also been cancelled. Additionally, Silver Airways and Tropic Ocean Airways will only be available for transportation from Bimini." IGY Marinas: "IGY is currently assessing the degree and intensity of impact that Hurricane Irma has had on our affected marinas." "The Department of Disaster Management and Emergencies (DDME) takes this opportunity to appreciate your goodwill during this time for the Turks and Caicos Islands (TCI). "Upon receipt of the information, the DDME will process your documents and respond providing the necessary clearance. Please contact the DDME at ddme.tci@gmail.com should your require any additional clarification." Boat International Media made contact yacht agent Earl Wyatt, owner and managing director of Sea Grapes International. He has offices on St. Maarten, St Barths and Anguilla – he was reached on St. Maarten. It is thought that the 24 hour curfew that was put in place on the island at 6pm on September 5 has been lifted during the hours between 8am and 3pm. "We are happy to report that all Horizon Yacht USA employees, as well as our fleet, are safe and had minimal damage from Hurricane Irma. If you were impacted by the storm, we hope you are recovering quickly. "As of now, our office remains closed due to phone, internet and power outages; however we are doing our best to regroup. For immediate assistance please contact us via email, and we will reply as soon as possible; we ask for your patience in our response time, as cell service has proven to be limited in our area. "We are hopeful that we will be fully operational within the next few days." "More than 1,100 Marines are providing support to the victims of Hurricane Irma. They're armed with 35 aircraft, 54 wheeled or tracked vehicles and 28 Zodiacs. They are able to support with search and rescue operations, providing purified water, aerial reconnaissance and distributing medical technicians and equipment." "Like all South Floridians getting back to normal day-to-day life today, I feel a bit dazed after the storm and enormously grateful to escape with minor damage at home considering what could have been. "Our office in Fort Lauderdale is fully operational, and we have power, phone and Internet, which feels like luxury after 72 hours of unrelenting humid heat. "Irma turned out to be a very difficult storm to track and as her path shifted further to the west and she weakened, it became clear that heavily populated South Florida would be spared the worst. "It was still a significant weather event that toppled trees, inundated entire sections of coastlines on both sides of the state and left many in the metropolitan area without power. The low-lying Keys took the brunt of it, with widespread damage still too recent to comprehend. Many boats were destroyed, lifted ashore by the storm surge or crushed as storage structures crumpled under wind gusts. But the storm did not deliver damage evenly. "In Palm Beach, for instance, the Rybovich superyacht marina is back to business as usual and Lauderdale Marine Center in our backyard, chockablock with yachts that sought shelter, only reports minor tree and limbs debris. Cleanup has begun and curfews everywhere, apart from in the Keys, have been lifted." "All visitors currently in the BVI, please note, there will be two cruise ships in St. Thomas US Virgin Islands tomorrow – Royal Caribbean and Norwegian Cruise Line. "Both ships will be taking visitors only to Puerto Rico or Miami. Check/Clearance is at 1:00 p.m. for 4:00 p.m. departure. The Native Son ferry will be providing the connecting ferry out of the BVI. "Persons are asked to contact Alani Henneman at the USVI Department of Tourism at 1-340-774-2244 for more information." "Members of the public are advised, passports can be retrieved tomorrow (Tuesday September 12, 2017) at the Immigration department between the hours of 12 noon and 2:00 p.m. throughout the remainder of this week. "Persons can also email: bviddmirma@gmail.com with the subject: Passport Retrieval for assistance." "Persons in the Territory are advised that if your entry permit is null/void, that there is a grace period being allowed as a direct result of the disaster. "Further announcements will be made with regard to immigration processes. The grace period will remain in effect until further notice." "While we all cope with the effects of the recent disaster due to hurricane Irma, the BVI Health Services Authority is advising that Peebles Hospital remains functional and open. Our contact number is 852 7500 or 394 3497. "Persons needing emergency services are advised to go to the emergency department. "Persons with cuts and bruises are advised to go to the Road Town clinic at Peebles Hospital for treatment. All BVI Health Services staff remain committed to providing quality care during this difficult period and ask for your patience and support. "Persons in the healthcare private sector are asked to volunteer their services where they can at Peebles Hospital. Remember to take your medication and remain hydrated." Captain Lucille Frye has organised a boat to bring supplies in as all air travel is grounded in Saint Maarten at the moment, and other islands also. We will be purchasing supplies and collecting donations from other islands and shipping them in to assist with medical supplies, food, clothing and bedding. Lucille Frye works with BWA in Saint Maarten and her colleague from BWA in Spain is also assisting. She and Noona Ayres are long term yachting industry players they plan to use the money as directly as possible to buy the supplies needed the most. 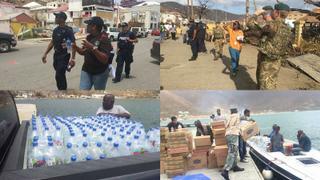 The contacts on the ground in Saint Maarten will be assisting with directing the shopping lists, and where supplies should be distributed first. You can find her Go Fund Me page here. 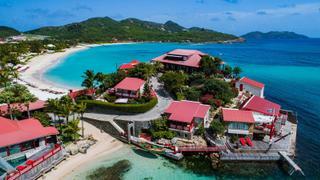 On September 11, Richard Branson shared images of the destruction on Necker Island urging people to contribute to the Virgin Unite foundation, which is coordinating fundraising to longer-term reconstruction projects throughout the British Virgin Islands. "I am writing from Puerto Rico, where I have travelled in order to further mobilise aid efforts and rebuilding plans for the British Virgin Islands and wider Caribbean. Communications remain mostly down in the BVI after Hurricane Irma. After sharing these updates and talking to various governments, aid agencies and media, we will be heading straight back to the BVI to continue helping the recovery effort on the ground. "This story is about the tens of thousands of people who have lost their homes and their livelihoods. We have spent the past two days visiting team members who live on Virgin Gorda and as many people as possible, distributing aid, water and supplies. We have seen first-hand just how ferocious and unforgiving this storm was. "There are worrying reports of civil unrest spreading – I urge everybody to stay safe, remain calm and support each other." "At the moment, the territory of Virgin Gorda appears to be without electricity and completely isolated from the point of view of telecommunications. The BVI government has created a crisis response center and is trying to restore connectivity. From the little information available about people working at the YCCS headquarters, there is no loss of life. "The clubhouse's main structure seems to have had a good impact on the impact of the hurricane while the Navy's piers have been damaged. "At the moment, we are organising an inspection to bring our staff safe, check the above and analyse the situation directly to help the community." Relief efforts are already underway, and the Royal Marines are using the island of Barbados as a distributing hub for delivering medical reserves, rations, clean water and emergency shelter kits to the affected Caribbean islands. 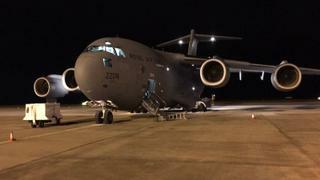 Approximately 500 personnel, including Royal Marines, engineers and Royal Air Force staff arrived in Barbados yesterday following a £32 million pledge from the British Government. "Thankfully Barbados has not been impacted by Irma but as you know some of our neighbouring islands in the northern Caribbean have experienced terrible devastation. Richard Branson’s son Sam was also here over the weekend gathering emergency supplies for the BVIs and packing them onto his boat. "In addition there are a number of local organisations including the Barbados Chamber of Commerce and the Barbados Hotel Tourism Association (BHTA), and numerous individuals banding together to gather much needed supplies to send to these islands. As an organisation we are also gathering what we can and working with some of our homeowners who are making donations to support the rebuilding of these islands. "We are also putting together an appeal to allow any of our incoming guests to contribute to the relief effort by way of bringing a small “pack” of items with them when they visit which we will ensure goes to one of the relief organisations. We feel we have to do what we can to help our neighbours in any way we can. "This is definitely the worst hurricane I have seen in my lifetime and we hope to never see another one." 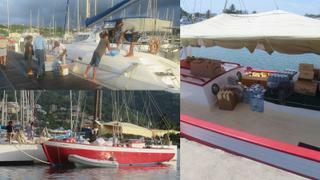 "Camper & Nicholsons Marinas based in the UK, own and operate several international marinas around the world, including Port Louis Marina in Grenada. "The forecast was that Antigua would be devastated, our infrastructure demolished, people killed and our economy destroyed. In the light of day, the picture is very different. "In Antigua, no life has been lost – all the people survived. The guests in our hotels are all well. Our airport will be open for flights into and out of Antigua by 2pm today. "The people of Antigua should all be very proud of the part that each of them played in our impressive story of readiness and resilience." “All our visitors remained safe during Hurricane Irma. The island’s hotels suffered only minimal damage and have already commenced clean-up operations”. "The entire housing stock was damaged. In essence, I would believe that the cost to repair infrastructure and the homes in Barbuda will be no less than $150 million and that is no exaggeration. 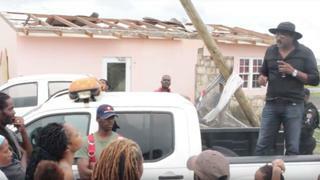 It is a total devastation, right now Barbuda is literally rubble and we have to raise a significant amount of resources now to rebuild Barbuda and to restore it to normalcy." Aid for Barbuda arrived in Antigua on September 8, comprising three cargo planes containing more than 54 tonnes of hurricane relief for the island.